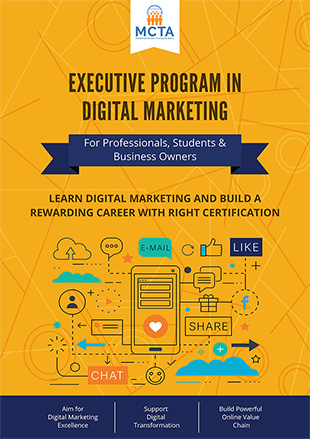 MCTA the best digital marketing training institute in Mumbai that helps you launch your career in Digital Marketing Industry. Our comprehensive Digital Marketing Course in Mumbai is designed to enhance your digital marketing Skills in a professional way. Digital marketing is an umbrella for marketing your products and services using modern Internet marketing technologies over the World Wide Web and technology platforms including digital marketing promotion tools, mobile phones, display platforms etc. Digital Marketing activities include Search Engine Optimization (SEO), Search Engine Marketing (SEM), Social Media Marketing (SMM), Display Advertisements, Content Marketing, Email Marketing, Paid Ads, Video Marketing & Mobile Marketing. As per definition, digital marketing is the promotion of products and services through various forms of electronic media. Industry today is deviating from Traditional Marketing towards Digital marketing since digital marketing involves the use of multiple channels and methods that enable companies to understand, analyze and measure campaign performance, trends and help them evaluate what is working and what isn’t. Digital marketing is much reliable, cost-effective, fast as compared to traditional marketing and delivers measurable ROI to companies. MCTA provides advanced digital marketing course in Mumbai, Navi Mumbai and Thane which covers all aspects of digital marketing which help you to promote your brand online across various online platforms. Launch your career in digital marketing with MCTA by filling our Enquiry Form!